It seems to me that the design of the cab windows of the VW EuroVan are not too complementary to the design of the Winnebago coach body in relation to wind flow. With the windows rolled down, too much air seems to buffet against the front of the coach body and funnel right through the windows in the van. 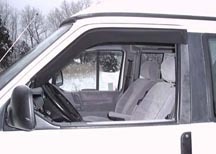 Here are some products about controlling air flow and wind deflectors. VW makes a set to fit the EuroVan. I haven't seen any and there is very little information about them. They seem to be somewhat pricey at around $90 and not too many dealers stock them nor will they order a set just so you can look at them to decide if they are right.